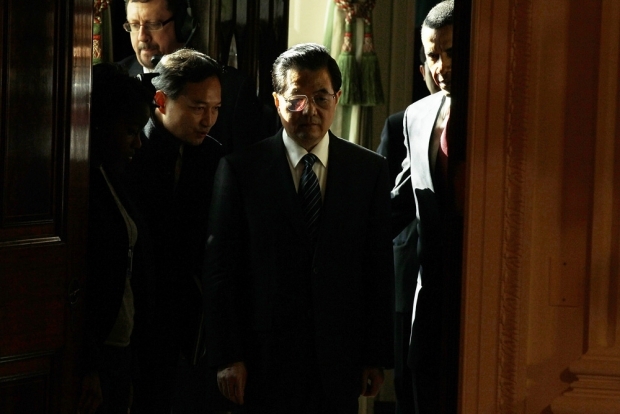 U.S. President Barack Obama, right, and Chinese President Hu Jintao, center, wait in the Green Room prior to the beginning of a joint press conference in the East Room of the White House, January 19, 2011 in Washington, D.C.
As part of our ongoing efforts to secure the hottest scoops for you, our Sinica team originally planned to storm Hu Jintao’s flight to Washington and record a live podcast with everyone’s favorite chairman during his flight across the Pacific. Sadly, this idea did not meet with equal enthusiasm after a good night’s sleep, leaving us to report on the ongoing U.S.-China summit from our regular studios in downtown Beijing. Joining Kaiser Kuo to analyze the Washington summit is Sinica regular Jeremy Goldkorn of Danwei fame, who brings his candid impressions of what both President Obama and Chairman Hu are hoping to achieve at the summit. Also in our studio is Gady Epstein, Beijing Bureau Chief for Forbes magazine and recently-outed China apologist and pro-slaver. Conspicuously absent is Bill Bishop and his chocolate cupcakes, both of which we will lure back with promises of further animal deportations if necessary. And capping off Sinica we have our regular financial news roundup courtesy of Caixin magazine.